Fantastic visuals, readers are made to feel as though they are truly visiting the state. 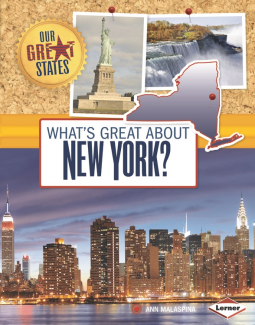 Begins with several pages on New York City, then moving to Cooperstown, Erie Canal, and Niagara. Highlights the state as it is today, with some information about the history of notable locations. This is not a book for students interested in the history of New York, instead this is an excellent resource for students curious about the Big Apple. Includes glossary, map, fact list, additional resources (print and digital), index. Recommended for elementary libraries. Advanced reader copy received through NetGalley in exchange for an honest review.